Canadians in greater numbers than ever before are turning to real estate to build wealth. The Authentic Canadian Real Estate (ACRE) system is the first of its kind to show average Canadians how to profit from investing in residential real estate. In Real Estate Investing in Canada, you will discover how to cut through the hype and emotion of any real estate market and accurately assess the inherent risks and rewards. Whether you are buying your first property or your 100th, this book provides new-found tools, strategies and condence to help you achieve your investment goals. "This is a great book. The information in just one of the chapters alone saved me over $28,000." "Full of practical Canadian content and presented in an organized and respectful system. It directly addresses how to get the money and financing you need to purchase real estate and achieve your goals." "One of Don Campbell's great gifts is his near-genius ability to take something that appears complex and break it down into a simple step-by-step system that anyone can follow. I am convinced that everyone will thoroughly enjoy, and more important, benefit financially, by reading this book." "The power of Real Estate Investing in Canada lies in the super simple, market-proven system that it offers you. It makes real estate dreams possible for any Canadian. If you are serious about learning the truth, cutting through the hype and being successful, this is your real estate bible!" The markets across the country are continually shifting and you must keep on top of the latest information. 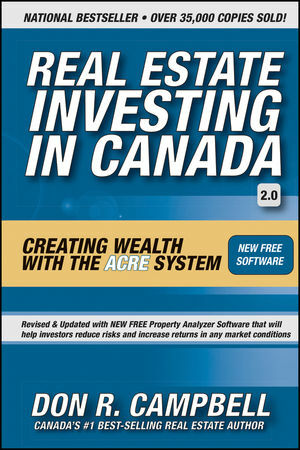 So, as a bonus, every registered reader of Real Estate Investing in Canada will have proprietary access to critical forms and ongoing market research at www.realestateinvestingincanada.com. DON R. CAMPBELL is a Canadian real estate investor, author and consultant. He is president of the Real Estate Investment Network (REIN™), whose membership exceeds 3400 successful Canadian investors and whose investment in Canadian residential real estate is in the billions of dollars. In his real estate seminars, held regularly in Vancouver, Calgary, Edmonton and Toronto, Don shares his years of hands-on experience as he teaches strategies he has personally tested in the real world. He has helped investors achieve their dreams, and charities such as Habitat for Humanity benefit from his enterprise. Please visit www.realestateinvestingincanada.com for Don R. Campbell's seminar schedule, information about REIN, and sign up for free discussion forums. You may also register your book to receive more valuable information about real estate investing. Chapter 1: Your Real Estate Success Road Map. Chapter 2: Flight from Nowhere. Chapter 3: Your Own Personal Belize. Chapter 4: Th e Four Most Important Words in Real Estate Investing: "What's Behind the Curtain?" Chapter 5: How to Tell If a Town Will Boom or Bust: The 12 Keys That Unlock the Vault. Chapter 6: Property Goldmine Score Card. Chapter 7: Skipping Stones to Success. Chapter 8: Not Any Port in a Storm: How to Find the Best Properties in the Best Areas. Chapter 9: The Property Analyzer Form: Where the Rubber Hits the Road. Chapter 10: Below Average or Super Successful: You Choose! Chapter 11: Placing Your Off er and Getting It Accepted. Chapter 12: Getting Your Banker to Yes! Chapter 13: Seven Winning Strategies for Getting the Financing. Chapter 14: From Corporate Job to Successful Real Estate Investor. Chapter 15: Negotiating Secrets of the Overachieving Investor. Chapter 16: Th e Big Close—A Day of Reckoning. Chapter 17: What Becomes of Richard and Emma? —Canadian Success Stories. Chapter 18: Your Personal Action Plan. Appendix 2: Canadian Real Estate Glossary.